A fire crew on the Corner Creek fire in eastern Oregon. The Corner Creek Fire has burned 26,000 acres south of Dayville, Oregon. 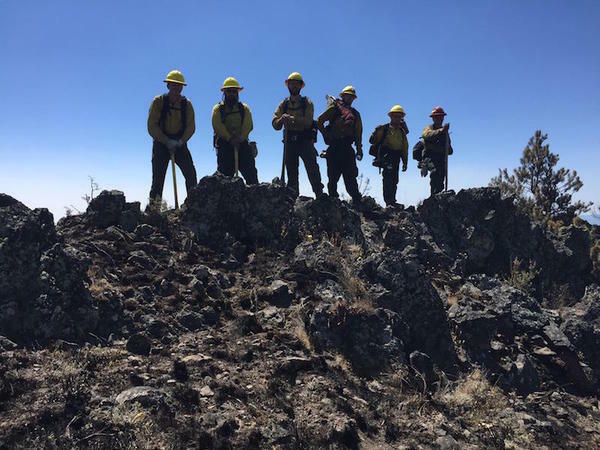 Now fire crews are having to find creative ways to fight the wildfire that’s creeping into the federally-protected Black Canyon Wilderness in eastern Oregon. The Oregon Department of Forestry’s Joe Touchstone said wilderness rules prevent firefighters from using traditional means, like digging firelines and dropping retardant. “So we use more aircraft and water drops and try to use the natural features of the landscape to slow the progress of the fire,” he explained. Those “natural features” include canyon walls and ridge tops that act as natural dead-ends for the flames. Touchstone said several hot shot crews with special training in wilderness fires are leading the efforts. The Corner Creek Fire is about 15 percent contained. It burned one hunting cabin but is not currently threatening any homes.